Ainjest High Speed Threading Attachment - Millhill Supplies Ltd.
For Colchester and Harrison lathes only. Please contact us if you need further information on this attachement. The high speed screw cutting attachment is designed to fit most standard lathes on the right hand side of the lathe apron. It allows threads to be cut at the high surface speeds applicable to tungsten carbide tooling. Imperial and metric models are available. The imperial version is suitable for whole, half and quarter threads per inch, either right or left hand. The metric version is suitable for the production of standard metric threads. 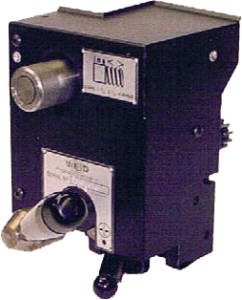 The unit mechanically synchronizes nut engagement positions and disengages on a stop bar, eliminating any need for threading dials or manuals co-ordination. There is no restriction on the length or diameter of thread to be cut — operation may be at the selected speed right up to a shoulder. 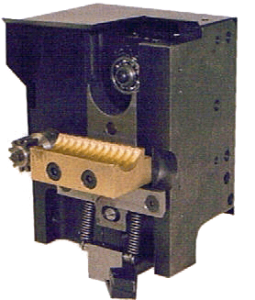 The high speed screw cutting attachment is so quick to set up that the lathe can be used continuously as a special purpose threading ma- chine, or intermittently for producing small quantities. It is the only screw cutting attachment which does not restrict the versatility of the lathe. No threading dial to watch. Cuts thread safely at high speeds close to shoulders, with a high degree of precision. Versatility of the lathe is unimpaired. Can be set and brought into use in seconds. No restriction on length or diameter of thread. Leadnut cannot be engaged until the control lever is correctly positioned. Operation: Internal buttress thread 10 TP1 on 3.0 in. diameter. Cut in 6 passes at 750 rpm in 45 seconds. Operation: External thread 11/2 in. diameter. BSP and internal thread 11/2 in. Diameter 11 TPI Whitworth. Cut in 5 passes at 1120 rpm in 25 seconds (each thread).